Are you faced with the fact that your web-browser is now redirected to annoying ad web pages and filled with a variety of ads and banners? The cause of all your problems with your machine is the blockerstop.com adware (also known as ‘ad-supported’ software) that has been installed on many computers around the world without users permission, so you’re one of many. Most probably, you do not even know how and where this ad supported software has got into your PC. In the steps below, we will explain all the general features of adware and its typical behavior on the machine, as well as effective methods for manually removing it from your machine. Most often, the adware affects the most common browsers like the Google Chrome, Mozilla Firefox, Microsoft Edge and IE. But such the harmful software as well may infect another internet browsers by changing its proxy settings. So every time you open the web-browser, it will redirect to the unwanted blockerstop.com site. 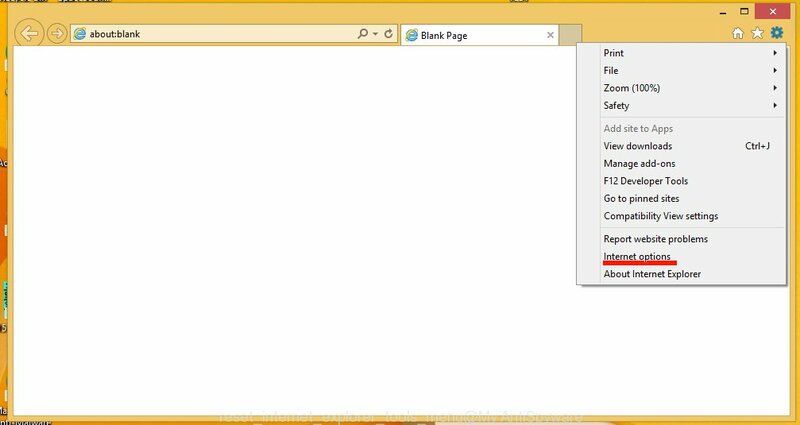 Even if you setup a new startpage, an unwanted page will be the first thing you see when you launch the Google Chrome, Firefox, Microsoft Edge and Internet Explorer. Technically, the adware is not a virus, but it does bad things, it generates tons of pop-ups, hindering or completely blocking the work in the web-browser. It may install other unknown and unwanted applications without your permission, force you to visit harmful sites. Moreover, the ad-supported software can download and install web browser hijacker. Once installed, it will rewrite your startpage with an unwanted web page. We recommend to delete the adware, which redirects your internet browser on the blockerstop.com unwanted web page, as soon as you found this problem, as it can direct you to web-resources which may load other dangerous software on your personal computer. If you perform exactly the instructions below you should be able to get rid of the blockerstop.com advertisements. Read it once, after doing so, please print this page as you may need to close your web browser or restart your computer. First, you should try to identify and uninstall the program that causes the appearance of unwanted advertisements and web-browser redirect to unwanted sites, using the ‘Uninstall a program’ which is located in the ‘Control panel’. Very carefully look around the entire list of installed applications. Most likely, one or more of them are responsible for the web-browser redirect to annoying blockerstop.com ads. If you have many programs installed, you can help simplify the search of malicious programs by sort the list by date of installation. 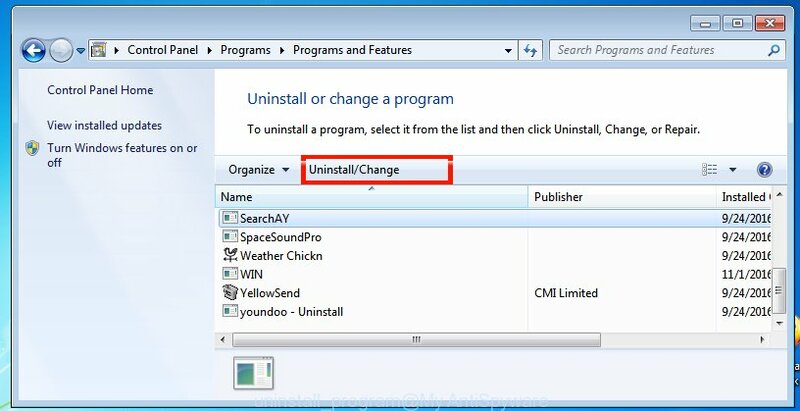 Once you have found a suspicious, unwanted or unused application, right click to it and press ‘Uninstall’. 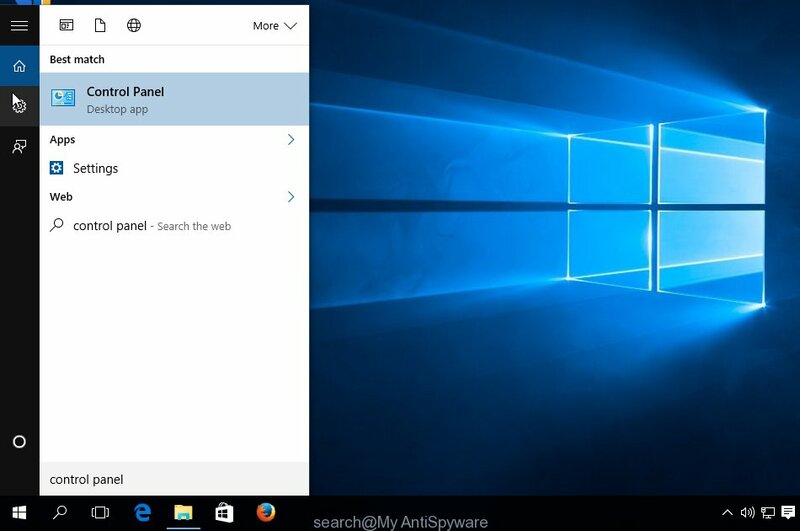 You will see a list of applications installed on your personal computer. We recommend to sort the list by date of installation to quickly find the applications that were installed last. Most likely they responsibility for the appearance of annoying pop-up ads and web browser redirect. If you are in doubt, you can always check the application by doing a search for her name in Google, Yahoo or Bing. 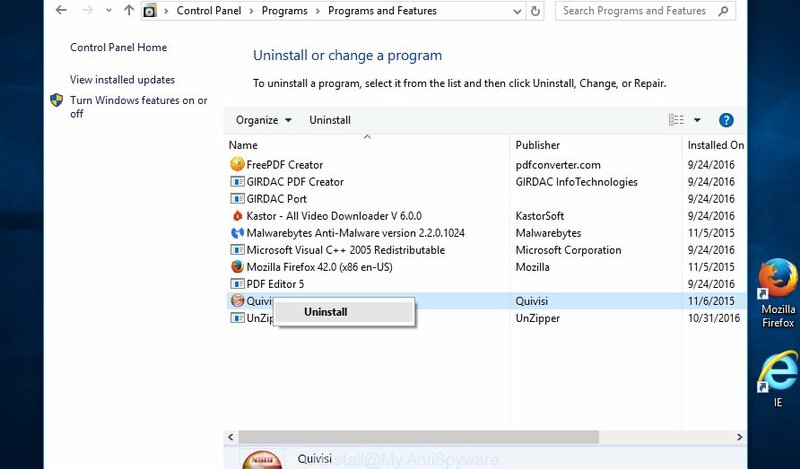 When the application, you need to remove, is found, simply press on its name, and then press ‘Uninstall’ as shown on the image below. 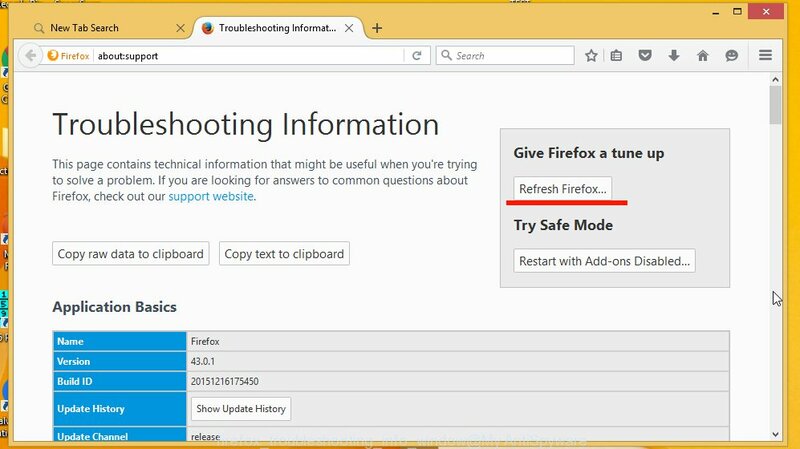 First, launch the Firefox. Next, press the button in the form of three horizontal stripes ( ). It will open the drop-down menu. Next, press the “Help” button ( ). In the “Internet Options” screen select the Advanced tab. Next, press the “Reset” button. 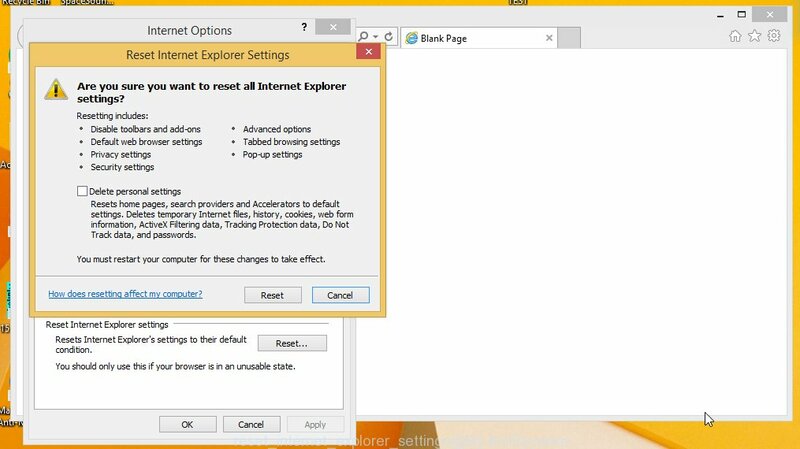 The IE will display the “Reset Internet Explorer” settings dialog box. 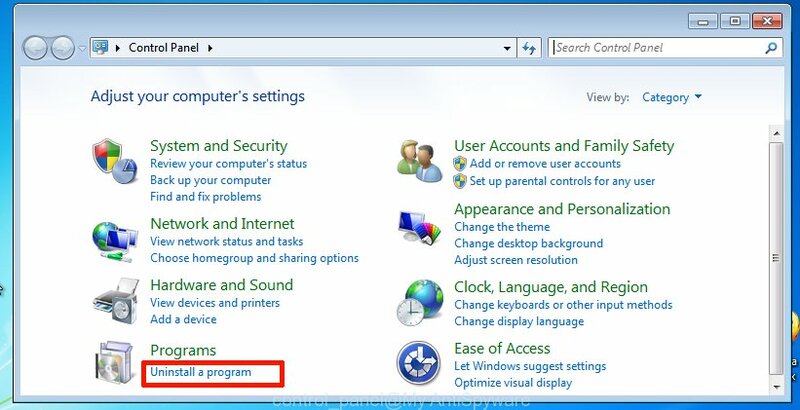 Select the “Delete personal settings” check box and press Reset button. You will now need to restart your computer for the changes to take effect. 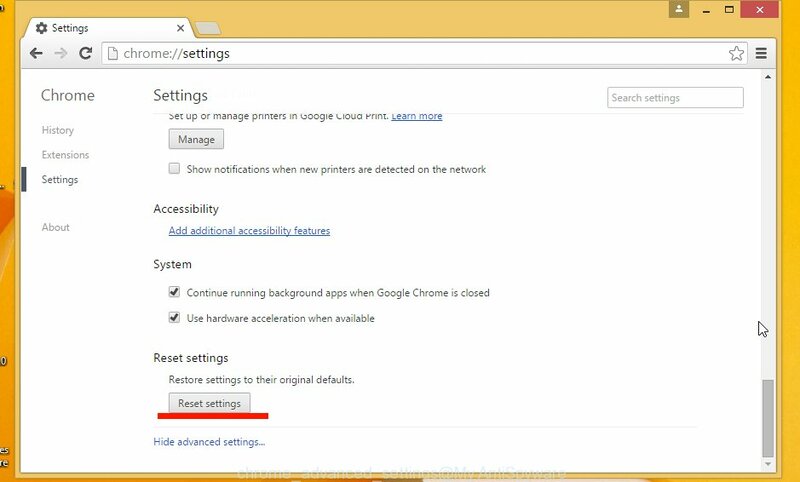 It will restore the Internet Explorer’s settings like home page, newtab page and search provider by default to default state, disable ad-supported internet browser’s extensions and thereby delete the redirect to blockerstop.com annoying web page. Once the adware is started, it can also modify the internet browser’s shortcuts, adding an argument similar “http://site.address” into the Target field. Due to this, every time you launch the internet browser, it will be redirected to an unwanted advertisements. If the annoying blockerstop.com web-site opens automatically on Windows startup or at equal time intervals, then you need to check the Task Scheduler Library and remove all the tasks that have been created by unwanted programs. Press Windows and R keys on the keyboard simultaneously. This shows a dialog box that called Run. In the text field, type “taskschd.msc” (without the quotes) and press OK. Task Scheduler window opens. In the left-hand side, click “Task Scheduler Library”, as shown below. In the middle part you will see a list of installed tasks. Select the first task, its properties will be open just below automatically. Next, click the Actions tab. Pay attention to that it launches on your system. 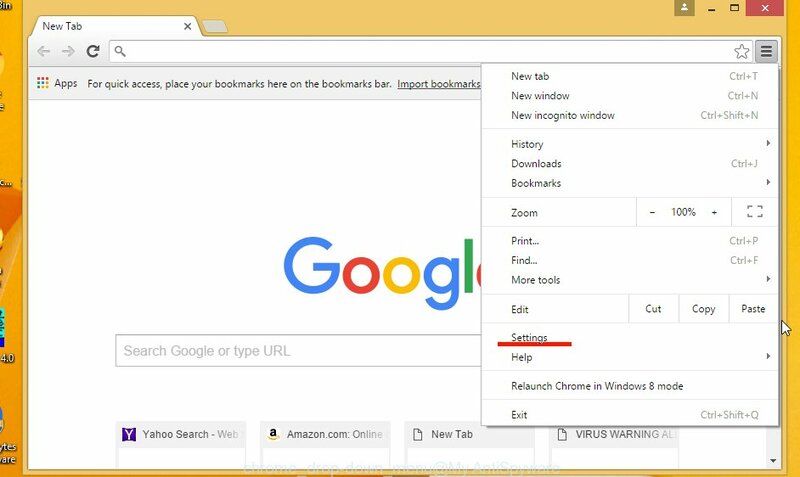 Found something like “explorer.exe http://site.address” or “chrome.exe http://site.address”, then you need remove it. If you are not sure that executes the task, check it through a search engine. If it’s a component of the malicious application, then this task also should be removed. Having defined the task that you want to remove, then press on it with the right mouse button and select Delete as shown on the screen below. Manual removal is not always as effective as you might think. Often, even the most experienced users can not completely remove blockerstop.com ads from the infected computer. This is because the adware can hide its components which are difficult for you to find out and delete completely. This may lead to the fact that after some time, the ad-supported software again infect your PC and it will start to display annoying blockerstop.com pop-ups. Moreover, I want to note that it is not always safe to remove adware manually, if you do not have much experience in setting up and configuring the PC system. 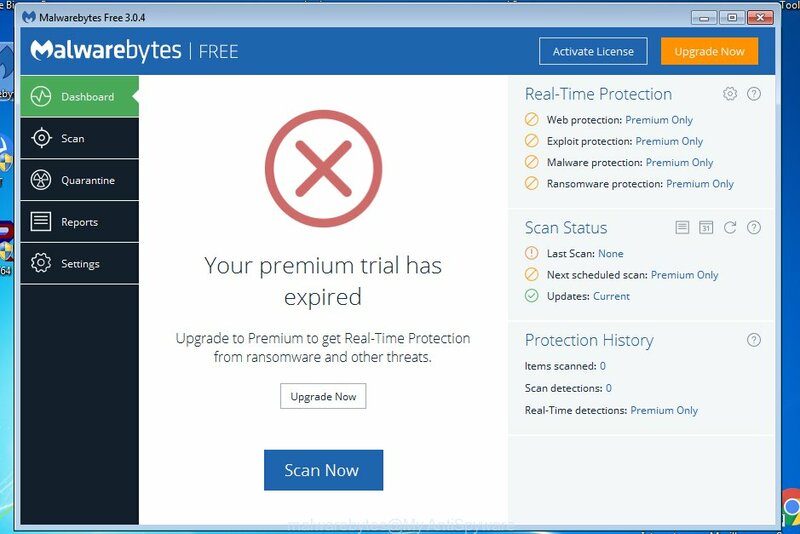 I suggest using the Malwarebytes Free that are completely clean your computer. It is an advanced malware removal application developed by (c) Malwarebytes lab. This program uses the world’s most popular anti-malware technology. It is able to help you get rid of browser hijackers, malware, adware, toolbars, ransomware and other security threats from your computer for free. When downloading is finished, close all software on your PC system. Next, start the setup file named mb3-setup. If the “User Account Control” dialog box pops up like below, click the Yes button. It will display the “Setup wizard” which will help you install Malwarebytes on your PC. Follow the prompts and don’t make any changes to default settings. Once installation is done successfully, press Finish button. 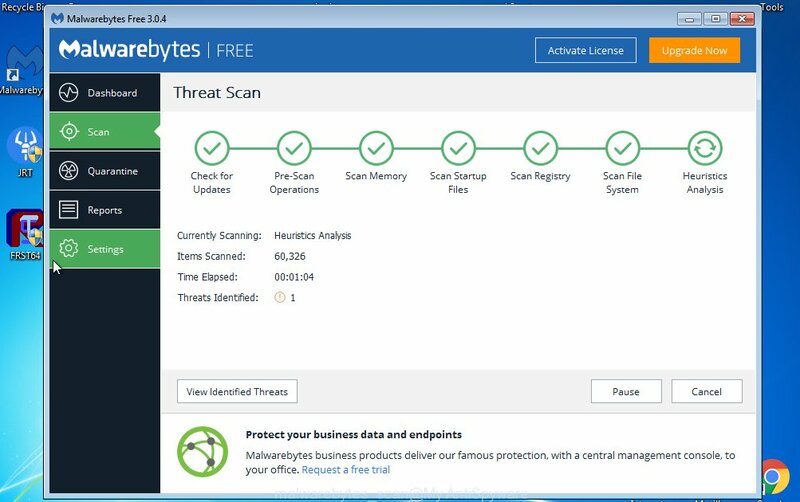 Then Malwarebytes will automatically start and you can see its main screen as shown on the screen below. Now click the “Scan Now” button to perform a system scan for the adware which cause a redirect to blockerstop.com. Once the adware or malware is found, the number of the detected objects will change accordingly. Wait until the the scanning is finished. Please be patient. When the system scan is finished, you can check all threats detected on your system. Make sure all entries have “checkmark” and click “Quarantine Selected” button. The Malwarebytes will begin removing malware and adware which cause blockerstop.com redirect. Once disinfection is finished, you may be prompted to restart your computer. I suggest you look at the following video, which completely explains the procedure of using the Malwarebytes program to get rid of ‘ad supported’ software and other malware. To increase your security and protect your PC system against new annoying ads and malicious web sites, you need to use application that stops access to dangerous ads and sites. Moreover, the program can stop the display of intrusive advertising, which also leads to faster loading of web-pages and reduce the consumption of web traffic. After downloading is finished, start the file named adguardInstaller. You will see the “Setup Wizard” screen as shown on the image below. Follow the prompts. 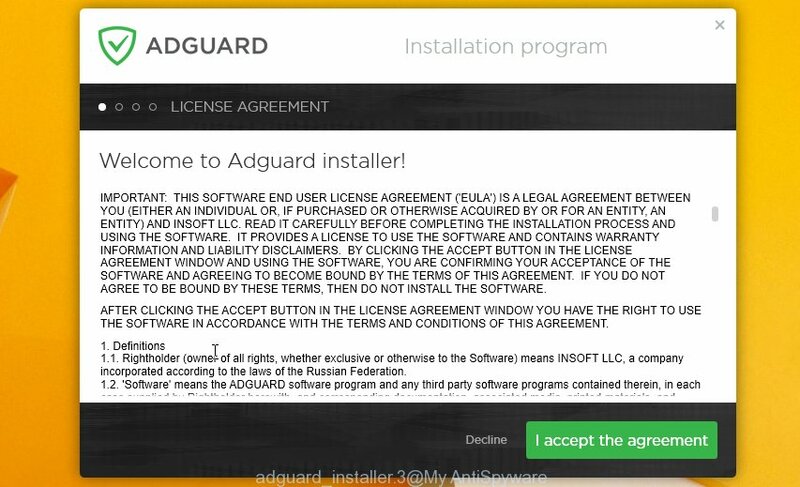 When the install is done, you will see a window as shown on the image below. In most cases, the default settings are enough and you do not need to change anything. 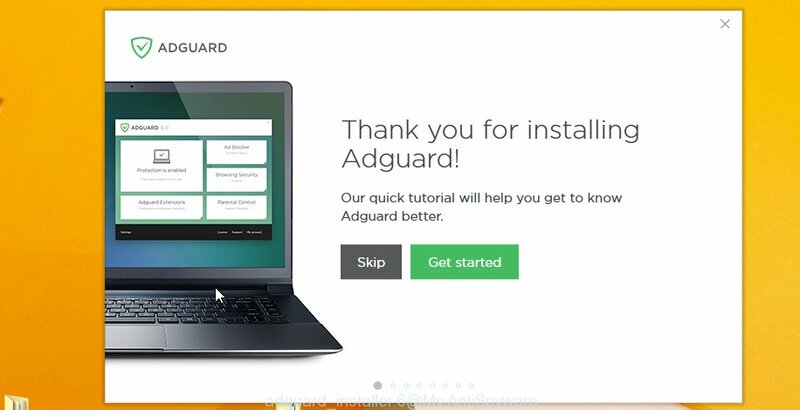 Each time, when you launch your computer, AdGuard will run automatically and stop pop-up ads, web sites like blockerstop.com, as well as other harmful or misleading sites. 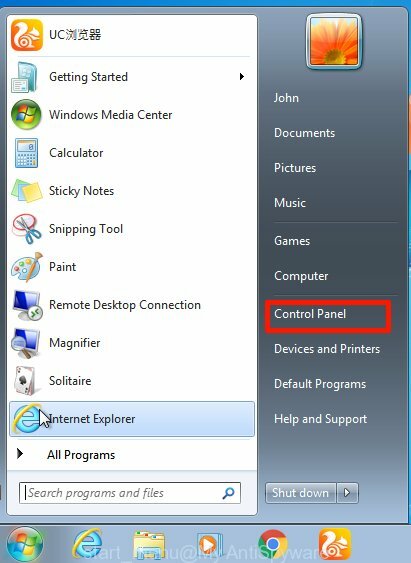 For an overview of all the features of the program, or to change its settings you can simply double-click on the AdGuard icon, that is located on your Windows desktop. Get rid of blockerstop.com redirect and malicious extensions with AdwCleaner. If MalwareBytes cannot get rid of the annoying blockerstop.com advertisements from the Google Chrome, IE, Firefox and MS Edge, then we suggests to use the AdwCleaner. AdwCleaner is a free removal tool for adware, browser hijackers, PUPs and toolbars. 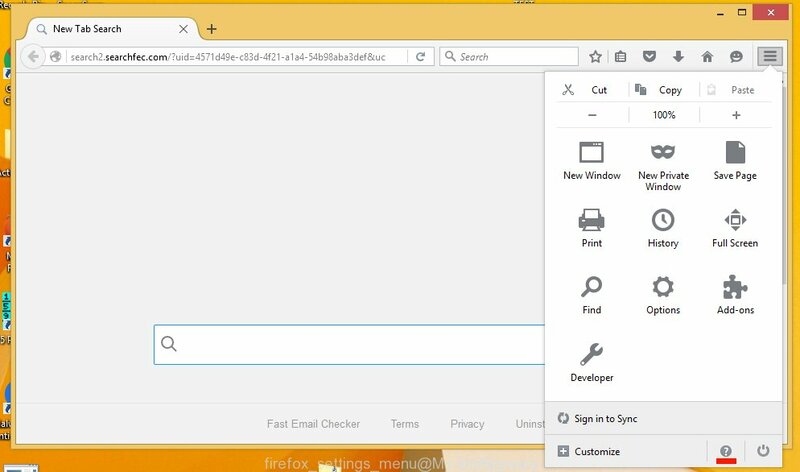 Now, click the “Scan” button to begin checking your PC system for the malicious extensions and ad supported software that opens advertisements from blockerstop.com page. When it has finished scanning your computer, it will display a scan report as shown below. Review the report and then click “Clean” button. It will open a prompt. Click “OK”. Once the cleaning procedure is done, AdwCleaner may ask you to reboot your computer. 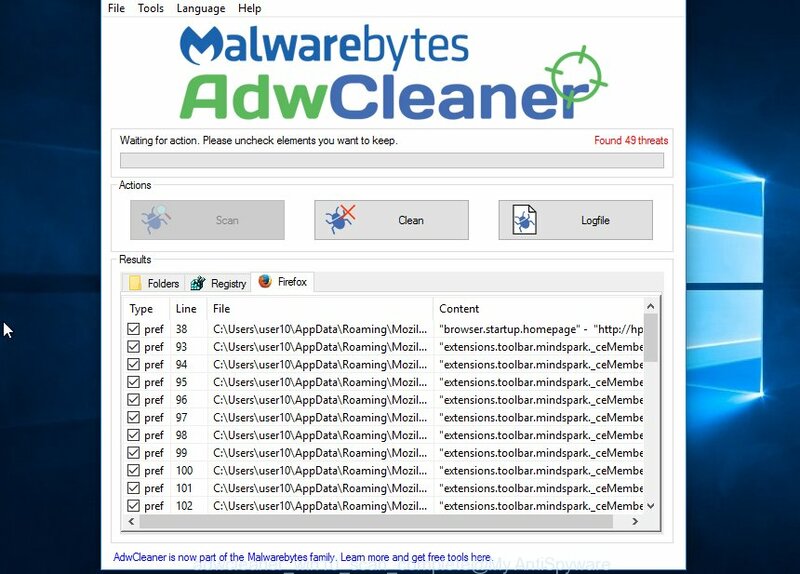 Look at the following video, which completely explains the process of using the AdwCleaner to remove ad supported software, browser hijackers and other harmful software. Now your PC should be free of the blockerstop.com pop-up ads. Remove AdwCleaner. 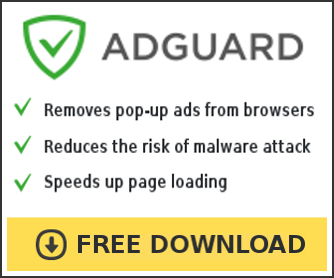 We suggest that you keep AdGuard (to help you stop unwanted ads and unwanted dangerous web-sites) and Malwarebytes (to periodically scan your PC system for new malware and ‘ad supported’ software). Make sure that you have all the Critical Updates recommended for Windows OS. Without regular updates you WILL NOT be protected when new dangerous programs and ad-supported software are released. If you are still having problems while trying to delete blockerstop.com ads from your system, then ask for help in our Spyware/Malware removal forum.